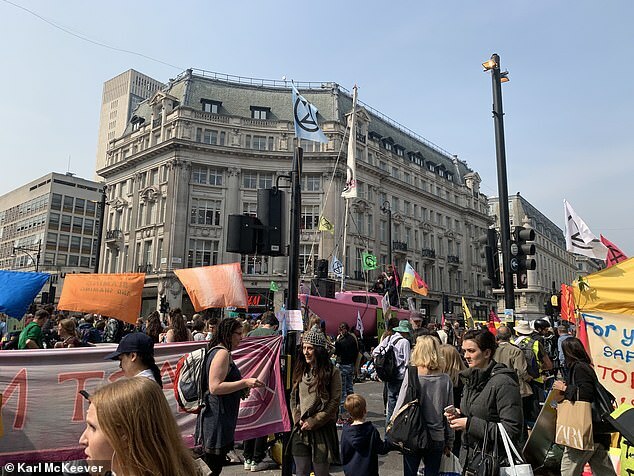 Climate change protesters have cost businesses in London’s West End £12million and counting, as they continue to block visitors and commuters from some of the capital’s busiest streets. 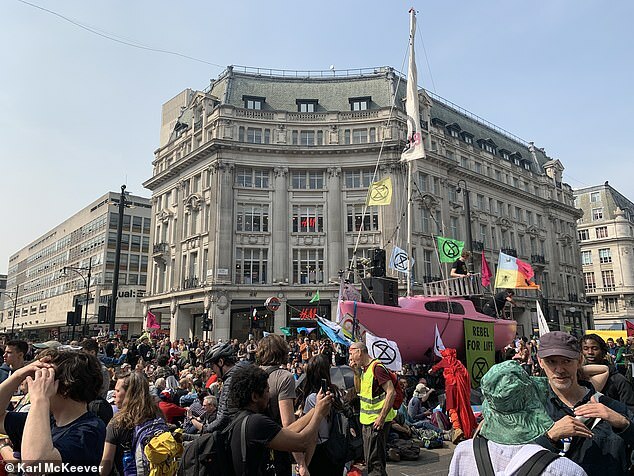 The Extinction Rebellion group has reeked havoc in London since Monday, causing disruption to at least 500,000 people with protests dotted around the City. A pink boat is blocking Oxford Circus, activists are dancing on Waterloo Bridge and rows of tents are cover key routes through the capital. Today, protesters glued themselves to a Docklands Light Railway train causing chaos on London’s transport network on the third day of mayhem. 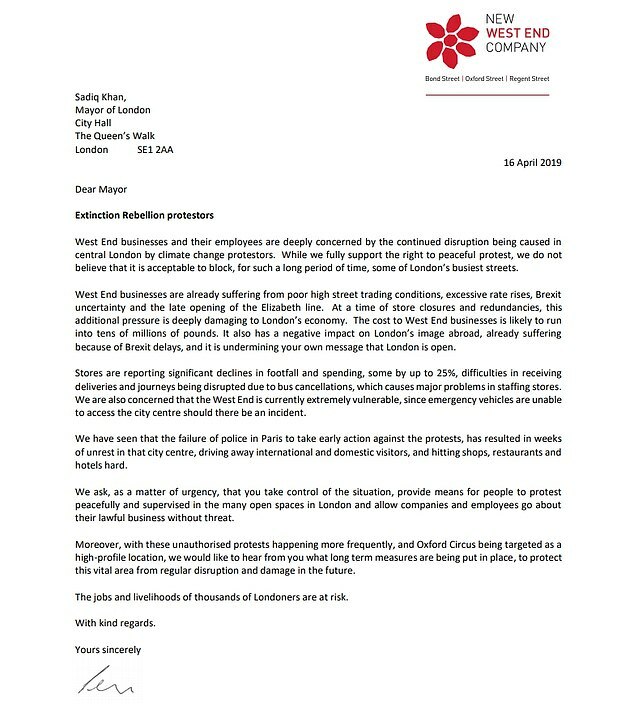 New West End Company, which seeks to protect the interests of firms operating in the centre of London, is now urging London Mayor Sadiq Khan and Metropolitan Police to ‘take control of the situation’ and enable shops, restaurants and their employees to ‘get back to business’. Police have shut down Transport for London’s public wifi to stop activists co-ordinating their protests underground and more than 300 people have been arrested in the last 48 hours. 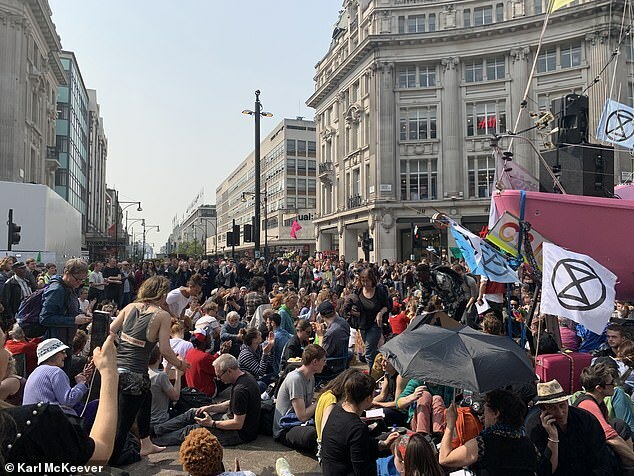 But protesters have still got their four strongholds of Parliament Square, Waterloo Bridge, Marble Arch and Oxford Circus and it is causing a harmful slowdown in footfall and spending. Boss of New West End Company Jace Tyrrell said: ‘West End businesses are deeply concerned by the continued disruption being caused in central London by the Extinction Rebellion protesters. In a letter to the London Mayor, Tyrrell said he is particularly concerned about the disruption piling more pressure on shops and restaurants at a time when high street firms are ‘already suffering’ from poor trading conditions. ‘This additional pressure is deeply damaging to London’s economy and reputation and has so far cost West End businesses over £12million, with some stores seeing a 25 per cent decrease in sales and footfall,’ he said. Tyrrell is anxious that the situation be resolved before the busy bank holiday weekend. ‘The West End is resilient and we know people will still come out over the Easter period to enjoy the shopping and culture, but we want their experience here to be a positive one,’ he added.